Elena was wonderful! She was thorough, kind, knowledgeable, flexible, and professional. I appreciated her willingness to accommodate all of my asks as well as suggest alternatives. Wish there were six stars. Elena is a charming, attentive and very knowledgeable guide. She went above and beyond to tailor our itinerary, and made sure our days were well-balanced, with some rest points. (SPB can be exhausting!) Our 2-person bucket list was more than fulfilled during our 3-day visit. Her driver also inspired confidence. Over lunch each day Elena shared her family's experiences of living through some key events in modern Russian history. Thanks for a superb tour, Elena! Elena is great! She is very sweet, knowledgeable & flexible especially as we had to cut our tour short by a half day, but still managed to see everything we were planning. She was prompt & worked well with Yuri (our driver). She picked great lunch spots (especially the local hangout) which helped us avoid the large summer tour groups. Her English is fluent & she had interesting insights into what life has been like living in Russia in the 80s-2018. I'd highly recommend for adults & families. Elena was the perfect guide for our 2 day St. Petersburg tour. Her knowledge of the history of Russia and historic places we visited was incredible. She is warm, friendly and her English is fantastic! Because we wanted to see something outside the city, she suggested a town where she spent summers. It was a wonderful day highlighted by eating cucumbers in her mother's garden and a lunch by a river in a local restaurant. Car and driver Yuri were great too! You cannot go wrong with Elena. Fantastic! 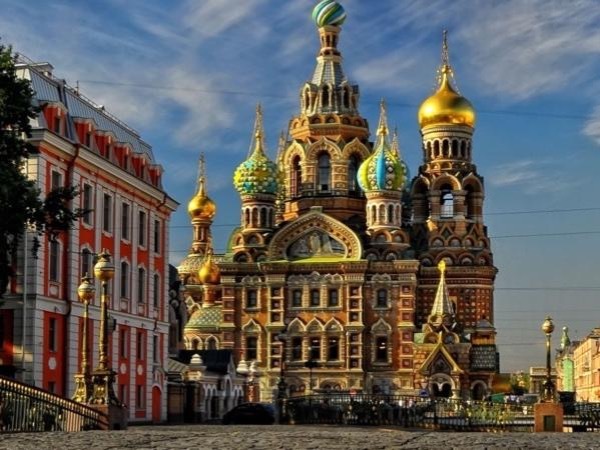 A great overview of St. Petersburg and it's complex history. Elena is a wonderful guide! Great tour to see the Russian countryside. We really enjoyed our tie with Elena. We spent a wonderful two days touring St. Petersburg with Elena and had a lot of fun. Elena is an excellent guide with a wealth of local and historical knowledge. Highly recommend. Elena was very knowledgeable about the sites that we visited, including historical information. She was a little flexible in our request to visit the Fan Zone in St. Petersburg. She also took us to a local store where my friend could buy World Cup clothing for less than the Fan Zone Area. Be sure to let Elena know any specific place or thing you want to do on our trip before hand. Don't expect to make last minute changes as the schedule is set when your tour visa is processed. Our guide Elana was excellent. Her English was perfect and she was extremely knowledgeable about everything. She knew all the history and details of all the sites. The tour exceeded our expectations. We highly recommend her and Tours by Locals. Our driver was excellent as well. It was a pleasure to have Elena as our guide. Her English was excellent as was her knowledge of the places we visited. She took note of our problems with walking & provided a wheel chair for easy access to sites where a lot of walking was required. She was charming, easy going with a good sense of humour. Without hesitation we would recommend her services to other travelers. I had a wonderful time in my first visit to St. Petersburg and highly recommend Elena! She is very knowledgeable and accommodating. She will adjust the tour to fit your personal tastes, and is very quick and flexible in making adjustments. It was also very interesting to hear her experiences and insight into Russian history. A special thank you to Yuri for quickly getting us around! Elena showed me so much of the city without ever feeling rushed. Thank you, Elena!! I would definitely hire you again! Elena and her driver, Yuri, were amazing! She shared her knowledge of St. Petersburg and surrounding areas with us and really made the tour enjoyable. We especially appreciated the extra effort she took to help out my sister who broke her leg the day before we arrived in St. Petersburg and was on crutches along with a walking cast. The arrangements she made for us to attend the opera were also very much appreciated. We would highly recommend her tours of St. Petersburg. Such luck to have her! This 2-day tour and our guide Elena were fantastic. She took us to the sites that were most important and that we were most interested in seeing but she also accommodated some special requests for shopping and mailing postcards. We enjoyed our two days of touring St. Petersburg immensely and look forward to coming back to spend more time. We definitely will use "Lena" again and would recommend her highly to help make your visit to this amazing city memorable. Elena L. provided our family group of 8 with a full day of really interesting sights. She provided us with a very comfortable mini bus with an excellent driver. She was a fun, very informative guide and walked us through a lot of places large groups could not have managed. She took us down "the world's longest escalator" so we could ride on a Russian subway. The full day tour was thoroughly enjoyed by all. Elena was delightful and we would highly recommend her for your next tour in St. Petersburg. Our tour with Elena was a highlight of our trip. She was able to customize a two day tour for our group of four, parents and our two 20-something kids. Having a van, a driver and Elena was VIP and allowed us to make the most of our time (pre-purchased tickets, short cuts, front door drop-off...). In addition to detailed knowledge of the history and sights, Elena grew up in St Petersburg and was able to share what life was like before and after the fall of Soviet Union. Great lunches with local food! Professional , efficient friendly. A pleasure to have as a guide. Stop! Look no further! Only Guide I Would Use In St Petersburg!! High energy, very knowledgeable, flexible on agenda, and great personality! Ran into a family that had tour with her earlier in the week...they echoed my statement above! Elena gave us a wonderful day in Saint Petersburg. She was flexible, excellent command of English and willing to share her personal experience growing up in Russia. I plan to use her in the future as I lead groups to Russia every year. She also helped us reserve an honest taxi company to and from the airport. We really enjoyed our two days with Elena in St Petersburg. She was very flexible and we feel like we saw everything we had hoped to see. Would highly recommend Elena. We really enjoyed ourselves in St Petersburg thanks to Elena and Archie. Elena's knowledge for all the sights, the history, etc, was amazing. Also, both Elena and Archie were very friendly and helpful so it felt a lot more like we were visiting friends who were then showing us their beautiful city. Great time with Elena. Gave us history plus personal insights into St. Petersburg/Russia. Much better than sitting on bus with 50 other people and waiting to get on and off. We were quickly dropped off on a corner by the sight and the driver was right where we needed him when it was time to drive to the next destination. Elena provided us with an outstanding experience. She is very knowledgeable and very professional. She made the tour very smooth. This was definitely the way to go for a quality experience. Her knowledge of history and the exhibits at the Hermitage was a big factor in the great experience. We were so thrilled with both Elena and Boris, her driver. I was told how difficult it would be to not use the tours from the cruise line because it was Russia and nothing could be further from the truth. We saw more, did more and got to know two wonderful Russians. Elena was so knowledgable, accommodating, and charming to be with. She really went out of her way to do what was best for us, such as getting a wheelchair in several of our stops. A one-on-one personal tour is the only way to see Russia. I found everything about the tour entirely satisfactory. I would give a rating of 5 [highest] to all questions. Yours truly, Harold Burnett. Elena is very knowledgeable and well planned. We saw most of the best sight and she even introduced us to very authentic Russian food which we enjoyed very much. It was such a wonderful tour we really couldn't ask for a better one. She gave us the best experiences. We are very happy with a tour and Elena as a provider She put all her love and effort to make our 2 days in st petersburg unforgetable she was very punctial and tolerant to answer all our gestions we will defenately come back to this magnificent city and will recomend you company to our friends. Elena ably supported by Eddie her driver was an absolutely outstanding tour guide! Her English and her knowledge of St Petersburg was absolutely outstanding and brought to life a whole series of major events in Russian history. She joined my wife and I for lunch where she was excellent company Good Luck in her career as she deserves success! Elena was just fabulous and fun on our 2 day tour of St. Petersburg. We all loved every minute of it. She is so knowledgeable on the history of St. Petersburg and all of it palaces and churches she made it so fun for us. I would highly recommend her to anyone planning on being in St. Petersburg. Elena is a fantastic guide! We will definitely have her as a guide again!. Our family was in St. Petersburg for one day while on a ferry cruise. We found Elena based on reviews. She was very accommodating and thorough in her planning: she booked a van and tickets for us, met us at our ferry and dropped us off. We visited Tsarskoye Selo, Peterhof, Hermitage Square and Church of Spilled Blood. She tells great stories, knows so much and is so fun! Excellent English. She even took us to a nice souvenir shop! Excellent! Novgorod has such a rich history. Elena knows the area since she is originally from the countryside near Novgorod. Her personal knowledge blended with the rich history of this city were invaluable in gaining an understanding of the important role Novgorod has played in the development of Russia. Thanks, Elena. A very good tour and Elena and driver were charming and very helpful. Elena is very professional in her work but also has an excellent personality . Nothing is too much trouble for her and she the finest example of what the perfect tour guide should be. the best recommendation I can give her , is that my family and I will be asking for her on next visit to St Petersburg . Elena showed me various places of interest in St. Petersburg over 5 hours. She is very enthusiastic, energetic and passionate about her city. We saw places of both historical significance and contemporary popularity. Elena is just old enough to remember what life was like in the Soviet Union and can share that with you. Her english is excellent. I would highly recommend Elena for any type of tour. TOUR GUIDE RESPONSE: Very good! My husband and I had a wonderful day with Elena as our guide through Peterhof Park and Palace and Catherine Palace. Elena was extremely knowledgeable about the Palaces but also gave us a great understanding of the history of St Petersburg. 5 out of 5. Highly recommended. We toured with Elena for 3 days and she was superb! Wonderful person and a great guide! TOUR GUIDE RESPONSE: I'm so happy you liked it! )) Please come back one day, Elena! We had 2 days touring Catherine Palace, Winter Palace&Hermitage, Cathedral Spilled Blood, St Nicholas Cathedral, Peterhof, Peter&Paul fortress, 2 authentic Russian restaurants. Elena, who is fluent in English, is completely familiar with all of the sites. The tour was further enhanced by Elena's broad knowledge of history and art. Tour accomplished with one of us in a wheelchair thanks to Elena's thorough knowledge of all sites visited including location of lifts and special access doors for wheelchairs. We really enjoyed our 1 day visit to St Petersburg. Elena was a great guide to her city, sharing its history and culture. Both adults and children in our family found the visit really interesting - a highlight to our holiday. She took us to more places than a comparable group tour and avoided queues and delays. I would recommend Elena to anybody who wants a personal tour from a local. Elena is helpful, practical and knowledgeable. We appreciated the way that she structured our tour to take into account our interests and the time available. Her skill in navigating through the Hermitage is most impressive. Elena was also of great assistance in making restaurant and taxi bookings. Her suggestions for the restaurants we went to were all excellent. Thank-you Elena. Six stars are not enough! Elena is extremely well organized, knowledgable, and interesting. In addition, she is utterly charming. Six of us spent two full days with her, and we loved every minute. If you have an opportunity to book her, don't hesitate. We had a great 3 days with Elena. She was knowledgeable, pleasant and flexible. We covered all of the top tour sites, had a private river cruise, went to the Ballet, and dined at some of the best restaurants in St Petersburg. We had a wonderful 2 days with Elena in St Petersburg. She is very knowledgeable and has a sweet personality. If I go back to the area I will definitely use her as a guide again. Elena, Gaby and I would like to thank you so much for the wonderful day you arranged for us in St Petersburg September 30th. Opting for a different outlook:"daily life experiences" of your lovely city and citizens we thoroughly enjoyed our day at the Vodka Museum, the Cat Museum, visitng a city market, finding the Anglican Church that my Great Grandfather had been married in, the wonderful delicatessen "Eliseevskiy" and much more. We thoroughly recommend your guidance. Thank you(both)for the day. Excellent choice of locations, very knowledgeable and articulate, friendly and helpful. Provided valuable service with travel arrangements, above and beyond the tour itself. Highly recommended. Despite having pneumonia, Elena arranged substitute guides and checked in with me every evening to see if things had gone well and to verify the next days'activities. I wish I could have met her. She was knowledgeable and very keen to help us in every way. The only glitch was that our plane arrived early and the taxi she had organized for us, wasn't at the airport. We had a great time! Three of us went with Elena and a driver to Catherine Palace. It was very crowded but Elena was terrific in moving us though the crowds inside the Palace. We chose to eat snacks outside at a small kiosk rather than a big lunch at the restaurant on the grounds. We also had Elena purchase tickets to the Amber Workshop which was terrific. We visited The Hermitage and a Treasure Room with Elena. The Hermitage was very crowded especially because it was a very rainy day. She was terrific in highlighting various rooms and exhibits. The museum is huge and overwhelming so Elena was very helpful. She also recommended a cute little restaurant nearby. I definitely would use her services again. What can I say but excellent. My husband doesn't like big group tours so this is 1 st time doing a private tour. We will never go back to group tours. Our driver was a young guy using his own car and loved his city. Elena has so much knowledge ,walks very fast, but we loved this. I had booked the diamond room so we arrived at Hermitage museum early and this was the best thing as we arrived before the huge crowds. We could not speak highly enough of this tour. Elena was terrific! We were able to visit the Palace and Mon Plesier, largely because we were just two travelers, with a minimum of waiting and feeling of crowds. She was fun with excellent English. Elena knew the amount of time we needed and helped us decide how to structure the special day at Peterhof. The driver was excellent also. My only complaint is that we were dropped at the wrong end of the airport for our flight and had to lug bags the whole length of the airport. Elena was excellent and took into consideration the weather and our interests. She was flexible and got us in and out of many crowded sites quickly and with no hassle. I can definitely recommend her (and our skillful driver Costia ) for visiting St. Petersburg and Peterhof . Elena showed us a village outside St Petersburg and her mother asked us for lunch at her dacha. We had a wonderful, different and happy day and can recommend Elena highly, especially as she managed to get us a guide at the last minute following a communications misunderstanding. Thank you, Elena. Elena was very friendly, knowledgeable, and we all enjoyed our tour of St Petersburg. We had two very good days with Elena and she organised our tour to meet our needs, she and the driver were very good guides. We were really impressed with the way she got us all into the places we wanted to go and negotiated the crowds. Her commentary was very informative. We would recommend her to other travellers. I have had many personal guides over the years and have to say Elena was the best guide we have had to date she made the trip special for my whole family. She is extremely knowledgeable on all subjects, i cannot recommend her enough.If we ever find ourselves in St Petersburg again i would contact her. Thanks for a great trip Elena!!! Elena was amazing!!! Perfect english, knowledgeable, flexible in meeting our ever changing schedule and all with a smile. She was one of the highlights to our visit to Russia. This was one of the best travel experiences we ever had! Elena was exceptional in every way - prompt, organized, very knowledgeable and most of all very personable and a joy to spend two days touring! It is the best investment we made and plan to visit again and use Elena as our tour guide! Many thanks for a wonderful experience! The tour was the highlight of our Baltic cruise. Elena is a delightful, knowledgeable, enthusiastic and considerate tour guide. We are delighted to have been shown around St Petersburg over 2 days by Elena and cannot recommend her highly enough. Elena was sick so Anna showed us around. Anna we was very knowledgeable and managed to help us by-pass the long queues. TOURSBYLOCALS RESPONSE: Elena became ill just before the tour, so it was not possible to let the Fray's know of the change in advance. Normally this would be the case. We're pleased that you enjoyed your tour with Anna. Elena was ill so Anna showed us around, she was very knowledgeable and helped us by-pass the queues. Elena was an absolutely wonderful guide. Resourceful, knowledgeable, friendly and patient - my friends and I all agree that spending time with Elena was a great way to get to know St. Petersburg. The two days we spent with Elena were well-spent. I would absolutely recommend her as a guide and wouldn't hesitate to use her again the next time I find myself in Russia. A very enjoyable "night out" in St Petersburg. Our guide, Elena, is very pleasant, speaks excellent English and is a very good driver. She was very considerate of our enjoyment and comfort. The show was excellent, vibrant, energetic and professional. Thank you Elena for looking after us so well. The tour was outstanding. Elena recounted Russian history to me in a very personal way. Elena is knowledgeable about St. Petersburg and all the palaces and points of interest that we visited together. Her flexibility in adapting to my schedule and accompanying me for 2 whole days was very appreciated and made the trip a pleasant and memorable one. We visited palaces, churches, museums, went to the opera, a Russian folk concert, had meals focused on Russian cuisine and did some fabulous shopping. Great!